Richie Jean Sherrod Jackson’s The House by the Side of the Road is a dazzling masterpiece composed of extraordinary events during the Selma Civil Rights Movement. Jackson, a native of Mobile, writes about her part in history when she embarked on a life-changing journey with Dr. Martin Luther King Jr. This astounding work recalls a time in history that entrenched in the nation’s historical and cultural memory the heroic acts that led the African American people to the voting rights march from Selma to Montgomery. It captivates readers from the beginning with a poem by Sam Walter Foss. 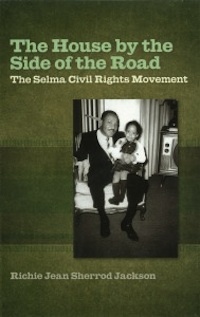 The poem’s imagery and symbolism create graphic elements that parallel Jackson's life and the events taking place near her house by the side of the road in Selma. The book continues with Jackson’s firsthand account that reveals behind-the-scenes events taking place during several months in 1965. Her personal narrative describes the black community of Selma and its leaders as being scrutinized, ambushed, and discredited for demanding social equality. King, an unparalleled shepherd, is epitomized in Jackson’s chronicle as a man who was a son, brother, husband, student, theologian, orator, and author. Her prodigious efforts to assist and loyalty to King led her to establish a headquarters that became a safe haven from the hatred of the socio-political status quo of the American South. Within this enchanting memoir, Jackson uses her cooking and her home to overcome discrimination, violence, and hatred during the wearisome months of 1965. Her cooking and safe haven created serenity and a dynamic working relationship between King and his contemporaries. Her home, so full of zeal and adulation, empowered them to continue their daily methodical plans and efforts. Her powerful story and authentic style impel readers of all races and creeds to experience an intimate glance into the thoughts and actions of our noble civil rights leaders. Jackson’s book illustrates that through the darkness and despair of many aftermaths, King continued to protest against the political corruption in Selma, thus creating equal rights for African Americans. The House by the Side of the Road closes in the afterglow of President Lyndon Johnson’s televised announcement of the passage of the Voting Rights Acts. Jackson notes that when President Johnson ended his speech with “We shall overcome,” he defined the political and emotional peak of the civil rights movement in 1965. An English graduate student at Troy University, Montgomery Campus, Kimberley Carter is director of General Education at Virginia College, Master’s-Postsecondary Education.